I'm sending Nell's letter back, as I know you want to keep it. Stockton's, I am ashamed to say, I have not yet given the family to read. 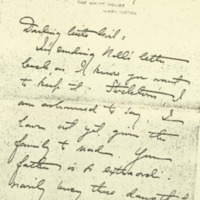 Your father is so extraordinarily busy these days that I hesitate to give him some interesting letters to read. How I hope Stockton will say in Texas! It seemed to me when he first went there there that the fact of his being a sort of educational pioneer would make the work much more interesting than any work in the North could be for him. And he needs so to feel he is doing something; and he's so outrageously modest that it's mighty hard to make him believe it. Oh, how I wish that man could be happy—really happy! It seems terrible that just because of an idea he can't be!Darling childie—how are you and your large family of children I hope you aren't worrying about Eleanor's slowness in gaining. L Davis went driving with me yesterday and she was telling me about her sister, who has a baby girl and who worries herself sick about the little thing because she doesn't gain steadily and as much as her brother did. L said if she had compared her Rael with Eleanor she would have been wretched; for Eleanor was always the whale she is now for her age, while Rael has always been behind below the average in weight, size and everything except health; and she has always been well. I can't see why a baby shouldn't be undersized as well as a grown person. Your baby is a tiny baby, while Ellen is a whale. That sweet peach, Ellen, isn't feeling happy today, as she is getting a tooth; but yesterday Katherine told me she had gained sixounces in the first week; so she has something to fall back on, anyhow. Of course you “saw by the papers” that we went up to the Grayson-Gordon wedding. It was as sweet a wedding as I've ever been to. The little chapel in which they were married looked lovely; and the bride did too, though she was quite pale and frightened looking. The doctor behaved as though he had always spent his week-ends getting married—quite self-possessed and cheerful and speaking up in a loud, clear and very firm voice. He looked smaller than ever, but very happy and handsome. She had no attendants at all, but after the betrothal service, Edith left our pew and went and stood beside her, to put back her veil after the s when the time came. It was very simple and informal and very sweet; and Edith looked too lovely, in a pale gray silk and large gray net picture hat with gray ostrich feathers on it. Bones, Helen Woodrow, “Helen Woodrow Bones to Jessie Woodrow Wilson Sayre,” 1916 May 26, WWP17535, Jessie Wilson Sayre Correspondence, Woodrow Wilson Presidential Library & Museum, Staunton, Virginia.